ALE has transported two LPG storage tanks 600km from Umm Qasr Port to Badra Oil Field in Iraq – the largest cargo that has ever been transported this distance in Iraq. The global heavy-lifting specialists were contracted by Samsung Engineering and Construction Limited (SECL) to transport two LPG storage tanks measuring 50m long and weighing 250t. Preparation started in June 2012, where ALE conducted a route survey of the 660km itinerary which highlighted some challenging crossings, such as passing through 11 bridges and negotiating obstacles. The transportation started in May, and upon receiving the tanks at Umm Qasr port, ALE transported these using three prime movers and 2 x 24 axle lines of conventional trailers. ALE used this long trailer configuration to enable the load to be spread whilst crossing the 11 bridges on route to Badra Oil Field. ALE’s country manager for Iraq, Alberto Pittaluga, said: “The successful execution of these deliveries over such a long distance is the consequence of the early engagement with the final destination. 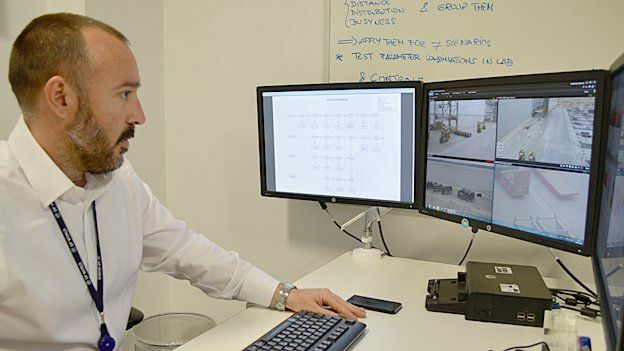 “ALE matured a complete mastery of the routing and its constraints allowing the team to pre-plan and propose a technically driven solution which enabled the awarding of this project and the successful consignments. “The team worked hard to navigate this challenging route, removing obstacles, constructing bypasses and engineering a trailer configuration to negotiate the multiple bridges. The tanks arrived in June and the total transit time from port to site was 12 days. 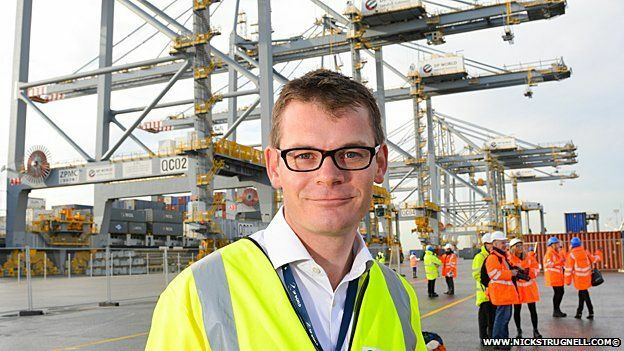 The Port of Felixstowe has announced plans for expansion that include doubling port capacity to accommodate the world’s largest vessels by 2030. 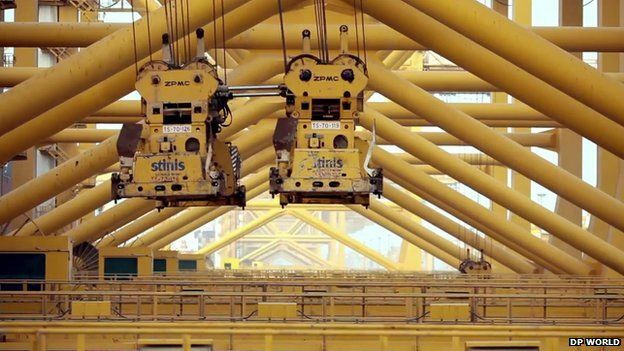 The UK’s largest port, owned by Hutchison Ports UK, awarded the lead contract to expand its berthage to the Volker Stevin and Boskalis Westminster (VSBW) consortium. The extension will increase the combined lengths of berths eight and nine, which opened in 2011, to 3,018 ft. The development will enable the port to permit two megaships with capacities of up to 21,000 teu to berth simultaneously. The strength of the quay wall allows the berths to be dredged to 59 ft or 16 m alongside depth. 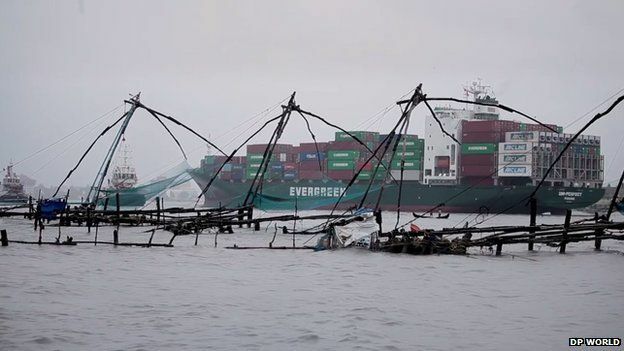 The first phase of development at the berths includes the acquisition of 10 ship-to-shore cranes (STS) from ZPMC, along with three additional ZPMC cranes when the current development is complete. Felixstowe has broken two records this year already having handled the largest ship in its history, the 19,100 teu CSCL Globe, before breaking the feat again in March, handling the MSC Oscar with 19,224 teu. Other projects include building berth 10, while the port has also applied for planning permission for the Bathside Bay project across the estuary in Harwich that would give it an 8m teu capacity. Cables whistle through pulleys, as quay cranes swing containers between ship and shore. Heavy machinery rolls along rails to the strange music of beeps and sirens. Further from the shore, 20m-high stacking cranes choreographed by computers load and unload lorries . And all this comes with a minimum of visible human effort. Welcome to the 21st Century container port. This is London Gateway on the River Thames in Thurrock, Essex. It’s owned by Dubai-based DP World. Britain’s newest container port – it’s less than two years old – uses the latest technology to make its operations as efficient as possible. In the control room, banks of computer screens could place you in any generic open-plan administrative office. But the hard hats dotted about hint that this is somewhat different. Closer inspection of some of the screens reveals charts containing numerous charcoal blocks – graphic representations of the metal containers that are the staple of the global freight trade. “From here we plan, control, monitor and execute all the container movements”, says operations manager Ivan Deosdad i Lopez. Tetris is a maddeningly addictive computer game involving the arrangement of coloured blocks. This is why London Gateway actively seeks job applications from gamers. After all, the controls of a quay crane are not too dissimilar to a game console. These quayside cranes are huge, roughly equivalent to the London Eye in height with their booms up. And they can move four containers on or off a ship at once. Each container is identified by an optical character recognition system that reads a unique identifying code – a combination of four letters and seven numbers. This helps track the containers as they move around the world. The 6m or 12m long metal containers can carry anything from car parts to clothing, perishables to periscopes – in short, a vast array of goods demanded by industry or consumers. Southampton’s port – also owned by DP World – offers customers “live terminal data” giving them the ability to track cargo “from ship to shore”, while the UK’s busiest container port at Felixstowe has just commissioned two new track-mounted gantry cranes to increase cargo volumes by rail. While a lot of the port operations are automated, people are still required. Yet the workforce is a far cry from the nearly all-male ports of old. 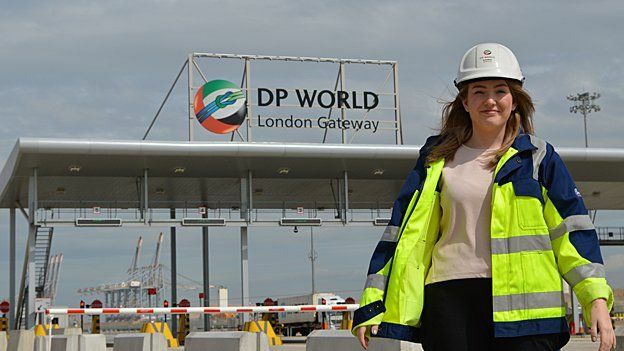 “Around 1-in-10 of the terminal operatives is female, which I guess is pretty impressive for the port industry,” says Lucy Golding, a terminal operative. Her duties include driving tractors to move containers within the port. She also happens to have a Masters in History from the University of Amsterdam. Elsewhere on the site, a former beautician from Basildon retrained to become a crane driver. Of course, it wasn’t always like this. Manual handling of loads on and off barges under sail occurred within living memory. “We used to carry fishmeal which used to stink to the high earth,” recalls 71-year-old Suffolk skipper Gordon ‘Willie’ Williamson. 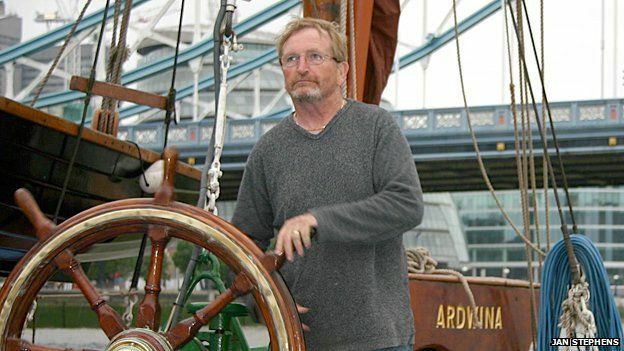 He’s now master of the 1909 Thames sailing barge, Ardwina. Holds that had carried such odorous cargo required fumigation before they could transport foodstuffs again, he says. 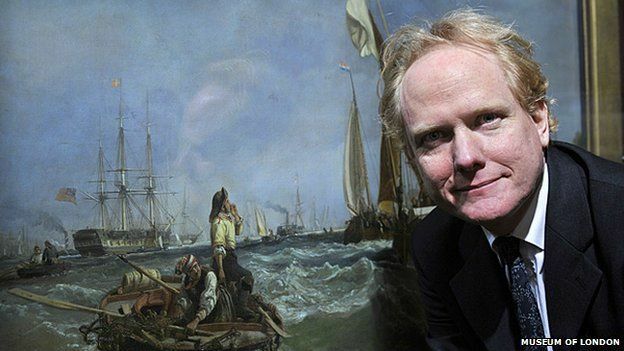 In the Museum of London Docklands, historian Alex Werner goes back even further. Although we now associate barrels principally with wines and spirits, in those days they would also carry dry goods, he explains. Global trade has moved into the digital world and ports are using the latest technology to help them attract new trade from Asia and the Far East. Ships calling at London Gateway take in countries such as India, Argentina, Morocco, the Caribbean, and South Africa – it’s like some vast never-ending version of London’s Circle Line. The quicker ports can move containers between train, truck and ship, and the more reliably they can keep tabs on them in port and in transit, the better it is for importers and exporters. Buyers are increasingly expecting next-day delivery of goods. Technology is helping to make our hugely complex global trading system as efficient and seamless as possible. But who’d have thought Tetris gaming skills would be an advantage? “Sluggish westbound volumes have brought about the worst spot market rate collapse that this trade has experienced.” That’s how Drewry Maritime Research summarized it in a report a couple of weeks ago. Since then, the collapse of the rates for shipping containers from China to the West has gotten worse with clockwork relentlessness. In mid-April, there had already been a lot of handwringing. The Shanghai Containerized Freight Index (SCFI) tracks spot rates of shipping containers from Shanghai to 15 major destinations around the world. At the time, rates from Shanghai to Rotterdam had plunged to $399 per twenty-foot container equivalent unit (TEU), down 67% from a year earlier, the lowest rate ever, and half of what was considered the break-even rate for these routes. It seemed that there would have to be some kind of uptick – that efforts by carriers to impose higher rates would stick. But nothing worked. So a week ago, there was a lot of handwringing because rates to Rotterdam had dropped to $243 per TEU, which wouldn’t even cover the cost of fuel of about $300 per TEU. But now, in the week ended June 19, the spot rates from Shanghai to Rotterdam plunged another 15.6% to $205, a previously unimaginable low. And it’s not just to Northern Europe. On the routes from Shanghai to the US West Coast, carriers also tried to implement rate increases effective April 1. But after an ephemeral uptick of $300 to $1,932 per forty-foot container equivalent unit (FEU), spot rates re-swooned. By the beginning of May, the index had dropped to $1,783, about back where they had been a year earlier. But look what has happened since. Last week the index plunged 5.4% to $1,268 per FEU, down 29% from the battered rates at the beginning of May. Spot rates to the US East Coast are also getting beat up: down 3.3% last week. Of the 15 destinations in the index, rates dropped for 11, remained flat for Taiwan and Hong Kong, and rose for Korea and East Japan. Container terminal alliances, could they be the answer? Could the development of alliances between ports or terminal operators meet some of the operational challenges posed to the container supply chain by the arrival of increasingly larger ships and consolidated carrier alliances? Neil Davidson, director of ports at Drewry Maritime Advisors, suggested to delegates at the recent TOC Container Supply Chain event in Rotterdam, that increased collaboration between terminal operators within a particular port, or between different port authorities may be one antidote to the “triple-whammy” of larger ships, larger alliances and the cascading effect of larger ships deployed on secondary trades. “It is the terminal yards that are really feeling the pain of the peaks caused by large amount of boxes being exchanged in the single call of an ultra-large container vessel (ULCV) – that’s where the pressure is felt, and where we are seeing a terminal that was built 10 years ago with a quay length and yard size now not fit for purpose. “The relationship between the quay and yard is changing, but you can’t always extend the yard, or you may not want to – land is expensive or may not be available – so there is much more obsolescence of terminals. He said that while there had always been a certain amount of terminal obsolescence – “go to any well-established port and the older terminals are not fit for purpose and newer terminals are established more downstream” – but this process was happening much more quickly, with modern terminals being walked away from. He gave the recent decision by Mediterranean Shipping Co (MSC) to develop a new facility at Antwerp as an example. “The existing MSC Home terminal behind the locks is a modern 5m teu facility, which, although very well equipped and efficient, is now considered not fit for purpose,” he said, adding that the physical fragmentation of terminals in ports, as well as their ownership, particularly where carrier themselves had a stake, also contributed the problem of increasing port congestion. “We are seeing a lot more inter-terminal transfer of boxes between alliance members. The US west coast has been particularly problematic in this respect – the G6 traffic in Los Angeles-Long Beach is spread across five terminals, which means there is a huge issue in terminal fragmentation,” he said. He described greater collaboration between carriers and terminals as a “no-brainer”, and pointed to the recent alliance between the port authorities of Tacoma and Seattle as an example. “I think there is going to be a need for greater co-operation between neighbouring authorities, but could there also be the development of terminal alliances? “There is a spectrum of possibilities: on one hand, you could have neighbouring terminals talking about how they do things and helping learn; and on the other, you have full-scale mergers or takeovers of neighbouring terminals, and there is a whole scale of activity across this spectrum – although the further you get towards acquisition, the nearer you get to anti-trust regulation,” he added. And Eryn Dinyovszky, general manager at Yilport Oslo, said the concession awarded to the Turkish operator in the Norwegian capital’s port was based on the failings of terminal fragmentation. “In Oslo there were two terminals competing but the market wasn’t big enough and meant neither could afford the capital to optimise their operations, so terminal consolidation was felt to be the best way forward. http://www.genesisfreight.co.uk/wp-content/uploads/2015/06/1010_1128_Containerfrachter-CMA-CGM-Christophe-Colomb.jpg 650 1000 admin http://www.genesisfreight.co.uk/wp-content/uploads/2015/07/logo_horizntal1-300x64.png admin2015-06-30 01:01:032015-06-30 01:02:01Container terminal alliances, could they be the answer? The dry bulk market has been devastating so far in 2015. However, June has somehow reversed it all in less than three weeks if judged by the Baltic Dry Index (BDI). June has delivered what May was unable to – keeping the momentum going. Since the drop in January, we have seen the BDI average at 576 for the four months of February to May. In contrast to that the BDI stand at 829 on 24 June 2015. According to data from Commodore Research, Chinese iron ore fixtures hit an all-year-high in mid-May. Most of it naturally came from China’s main supplier Australia, but the demand was supported by an all-year-high level of shipments out of Brazil too. Since then Capesize earnings lost some ground only to come back with a vengeance as more shipments were coming out of Brazil and Australia again. The weekly number from Brazil went up by 45% when comparing the time up-to mid-May with the following weeks. 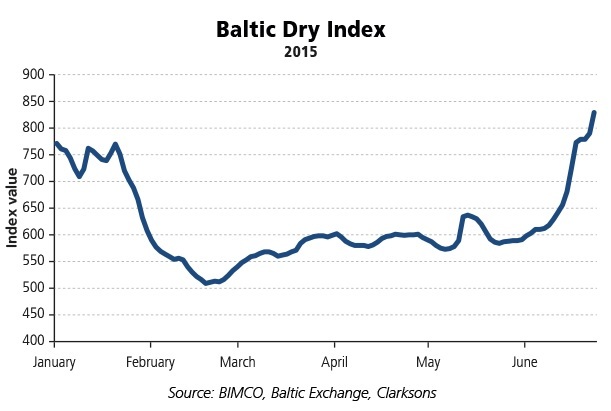 Chief Shipping Analyst at BIMCO, Peter Sand, Says: “We have seen the BDI constantly go higher since end-May. Chinese iron ore fixtures has been on a slow but rising trend throughout the year, so what we are seeing now has been a long coming. The BDI is lifted on the back of stronger Capesize earnings which has more than doubled during the month of June. 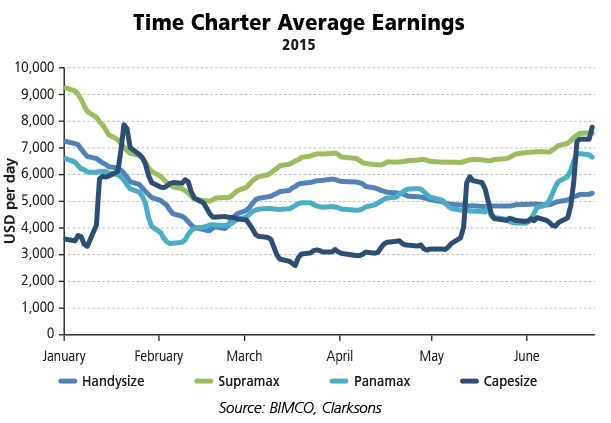 Panamax earnings also improved significantly since late May. Under the latest proposals made by Greece’s creditors, the country’s shipping companies face paying a higher tonnage tax and a phasing-out of special tax allowances which they have enjoyed, according to documents seen by Reuters. Together with tourism, its shipping industry is a vital generator of income for Greece. The current taxation system has included voluntary payments by the shipping companies and owners who include some of the country’s wealthiest tycoons. According to an official document indicating steps Greece must take, its lenders say the country must “increase the rate of the tonnage tax and phase out special tax treatments of the shipping industry”. A separate document showed Greece had made a proposal to “increase tonnage tax and implement an effective taxation framework for commercial shipping”. Any attempt to impose heavy taxes after decades of relative fiscal freedom raises the risk of an exodus of oligarchs and businesses which are major employers, further damaging an economy that has endured years of crisis. “There are going to be serious implications for the commercial shipping companies in Greece if such an increased tonnage tax will be applied because they will not be competitive any more in the international market under heavier taxes,” one Greek shipping industry source said. Greek Prime Minister Alexis Tsipras accused international creditors of “blackmail” on Friday after euro zone partners offered to release billions in frozen aid in a last-minute push to win his acceptance a cash-for-reform deal. While Greek shipping magnates generally operate from the Athens suburbs and the port of Piraeus, their companies are largely registered in the likes of the Marshall Islands and the Turks & Caicos. The firms are often listed on stock exchanges abroad and their ships fly foreign flags such as Liberia’s. Another Greek shipping source said the Greek tonnage tax system was already higher than in other European countries. “Moreover, it has a wider scope as it applies not only to vessels under the Greek flag, but to all vessels managed by Greek management companies,” the source said. Greek shipping has been part of the national economic lifeblood for thousands of years, but the industry remains mobile. The Greek fleet, which includes Greek flagged ships, is one of the biggest in the world. “The owners have no problem at all to relocate. If it is not to their liking, no one can stop them from leaving. (The ruling party) Syriza will be gambling with this,” said John Faraclas, a London-based shipping commentator and independent ship broker. Theodore Veniamis, head of the Union of Greek Shipowners (UGS) who speaks on behalf of the association, was unavailable for comment, his office told Reuters on Friday. In its recent annual report the UGS said the country’s shipowners had already agreed to the doubling of taxation of all ships operated from Greece irrespective of their flagging. “The immediate and direct response of the overwhelming majority of the Greek shipping community fulfilled the tax collection targets for the first year and has undoubtedly proven the determination of our sector to support our country during the economic crisis,” the UGS said. Quebec hopes to attract billions in private investment to develop its maritime infrastructure and create 30,000 jobs by 2030, Premier Philippe Couillard said Monday. Couillard made the announcement at the Port of Montreal and said his government’s $9-billion maritime strategy is a major pillar of his plan to relaunch Quebec’s economy and make Quebec the international point of entry into eastern North America. The Liberals campaigned in 2014 on a $7-billion plan to boost maritime infrastructure but Couillard said his government realized after being elected there was more interest from the business community than originally thought. He said he hopes $4 billion will come from private-sector companies looking to invest in projects along the St. Lawrence River relating to industries such as tourism, fishing and transportation. A major part of the plan calls for the creation of a maritime transportation logistics hub in Contrecoeur, about 60 kilometres north of Montreal, and another one in Vaudreuil-Soulanges, just west of the city. Couillard hopes the overall strategy will create 10,000 jobs within five years and 30,000 by 2030. “Quebec has a unique opportunity to establish itself as the international door of entry into eastern North America with regard to goods and transit,” he said. What is currently unclear is what part the federal government will play in Quebec’s maritime plan, as the country’s ports fall under federal jurisdiction. Moreover, Ottawa will likely have to balance a competing claim from Halifax, which also has an important maritime sector. Ottawa announced more than $130 million in January for renovations at the Port of Montreal, which is expected to receive more traffic once the free-trade deal between Canada and the European Union is finalized. Quebec’s union of municipalities as well as the Canadian Federation of Independent Business welcomed Monday’s announcement.